For whatever reason, I've been (unintentionally) putting off reading this book. I think I just haven't really been in the contemporary mood. Now that I've finally read it, I'm upset with myself for putting it off so long! I am back with another book review, Simon vs. 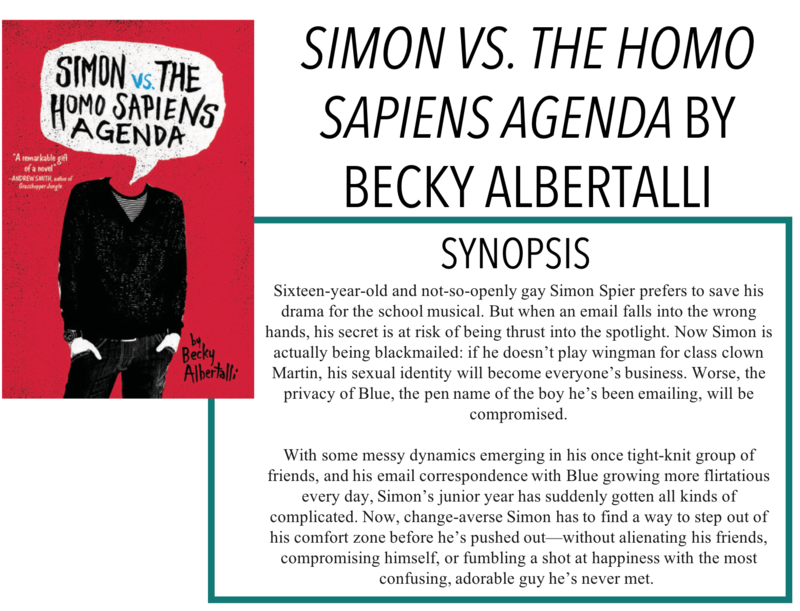 The Homo Sapiens Agenda by Becky Albertalli. This book follows Simon, a sixteen-year-old who is not-so-openly gay. When a fellow classmate, Martin, finds an email between Simon and a mysterious guy who calls himself Blue, Simon is blackmailed into getting one of his friends, Abby, to go out with Martin. As Simon tries to navigate the situation, he also really wants to find out who Blue is. Now normally, as a rule, these days, I don't read a lot of YA set in high schools. I know there is a lot of controversy and conversation over adults reading YA - and while I would consider myself more in the NA range than the adult range - there is just something about reading a story set in a high school that brings back some less than idyllic memories. I knew, however, that I would have to make an exception for this book because even before reading it, I knew it was going to be one of those all-American high school stories. I've never read a book by Becky Albertalli before and I've really been sleeping on her books! I thought the storyline was crafted really well. Most contemporaries - or even romances - have a predictable story arc and while Albertalli didn't not follow the usual pattern, she does shake it up quite a bit. I really loved how the story was laid out and the writing style was a lot of fun - I can definitely see why they made it into a movie, I can really see it in my head. As far as coming-out-coming-of-age novels go, this was probably one of the lighter ones I've read. Simon's family is very accepting of him, which he recognizes, and aside from a few bullies at school who immediately get shut down by a teacher, he gets no real trouble from his classmates. This wasn't a gritty coming out novel, but that certainly isn't unappreciated. Hopefully, other kids who are struggling can see Simon and find comfort in his story. Overall, I really enjoyed this book and if you - like me - have been living under a rock, I highly suggest you pick this one up!